Steel is an alloy of iron and other elements, primarily carbon that is widely used in construction and other applications because of its high tensile strength and low cost. Steel’s base metal is iron. 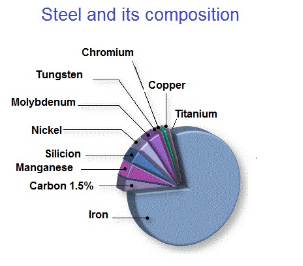 The carbon content of steel is between 0.002% and 2.1% by weight for plain iron–carbon alloys. These values vary depending on alloying elements such as manganese, chromium, nickel, iron, tungsten, carbon and so on. Today, steel is one of the most common materials in the world, with more than 1.3 billion tons produced annually. It is a major component in buildings, infrastructure, tools, ships, automobiles, machines, appliances, and weapons. Steel making is the process for producing steel from iron ore and scrap. In steel making, impurities such as nitrogen, silicon, phosphorus, sulfur and excess carbon are removed from the raw iron, and alloying elements such as manganese, nickel, chromium and vanadium are added to produce different grades of steel. Modern steel making processes can be broken into two categories: primary and secondary steel making. Primary steel making involves converting liquid iron from a blast furnace and steel scrap into steel via basic oxygen steel making or melting scrap steel and/or direct reduced iron (DRI) in an electric arc furnace. Secondary steel making involves refining of the crude steel before casting and the various operations are normally carried out in ladles. PRC, EU, Japan, India and US are the largest producer of steel in the world.